More productivity with less effort - Just Note It! 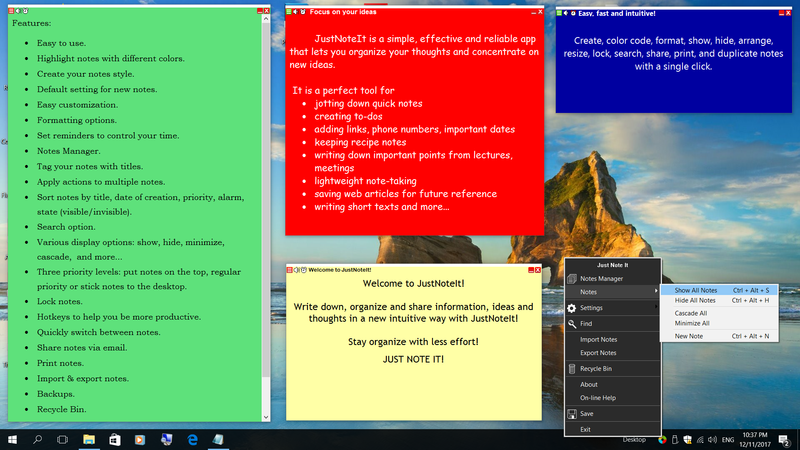 Write down, organize and share information, ideas and thoughts in a fast, intuitive and reliable way with JustNoteIt! 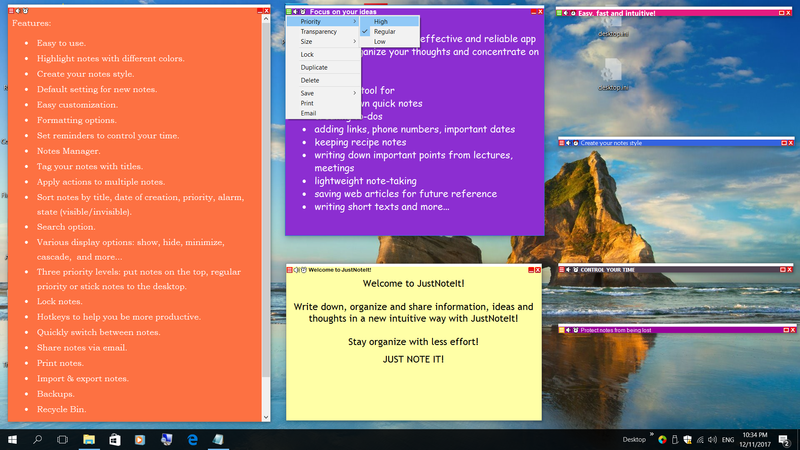 It is a simple yet functional desktop sticky notes app to jot down all the things you want to remember. 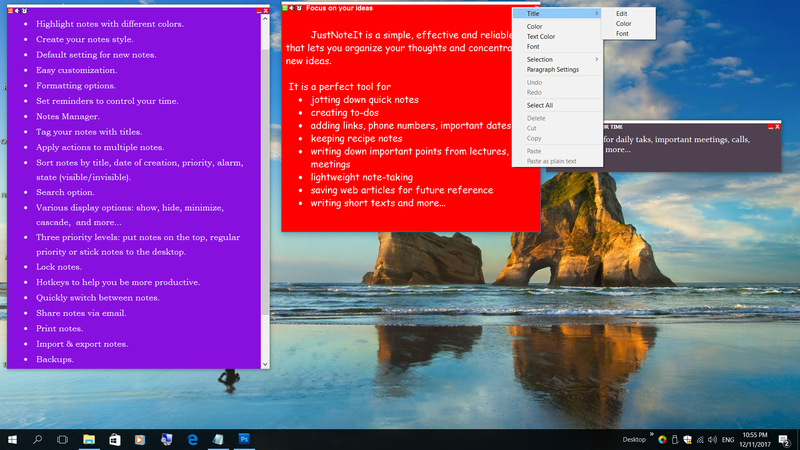 Download JustNoteIt for Windows 10. 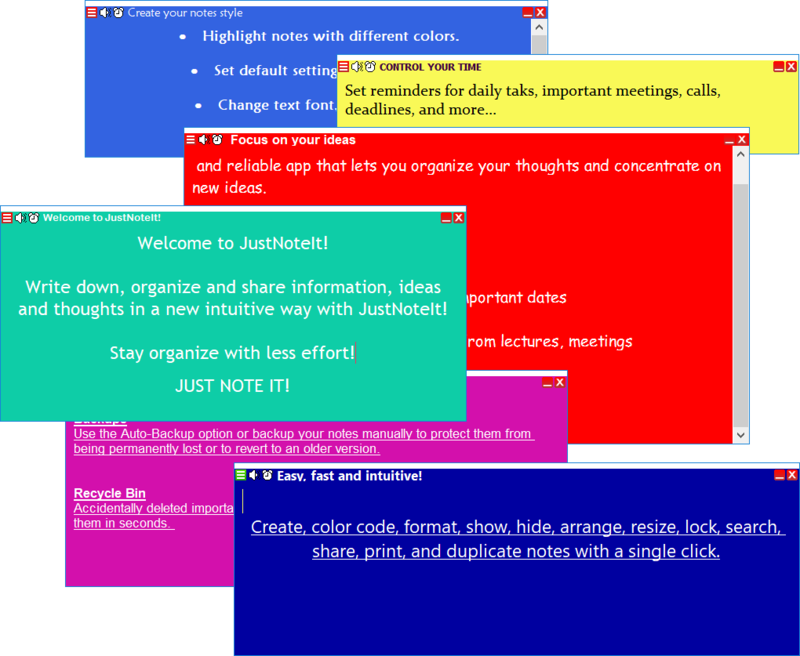 Download a FREE 7-day trial of JustNoteIt on your PC and test it without any restrictions. The trial version is not available to users on Windows 10 build 10.0.10586 or earlier. For various reasons, some users prefer to stick to older versions of Windows. If you use Windows XP, Windows Vista or Windows 7, you may download JustNoteIt using the download link below. Stay organized - Just Note It! Welcome to the JustNoteIt official website. Through the easily accessible menu you can quickly customize, edit, share, read, search, manage, duplicate, and print your notes. You may create as many notes as you like and keep them all in one place. 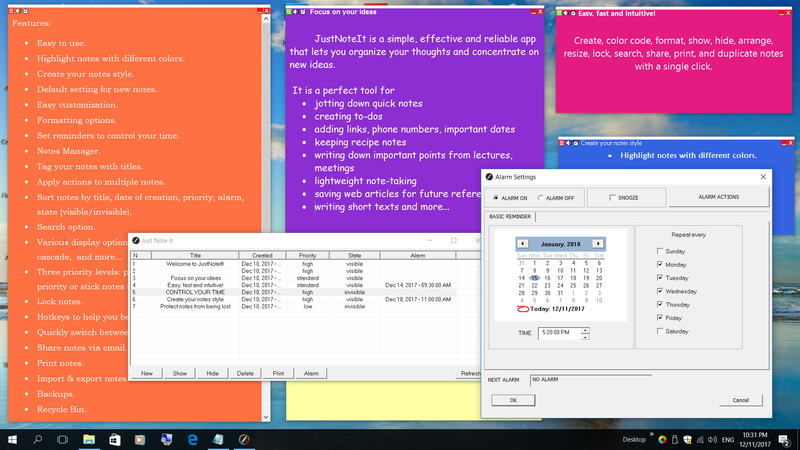 Apart from placing colored notes and reminders on the computer desktop, JustNoteIt has some additional features such as Notes Manager, Search option and Notes with different priorities, that help you efficiently organize your notes. Notes with different priorities. 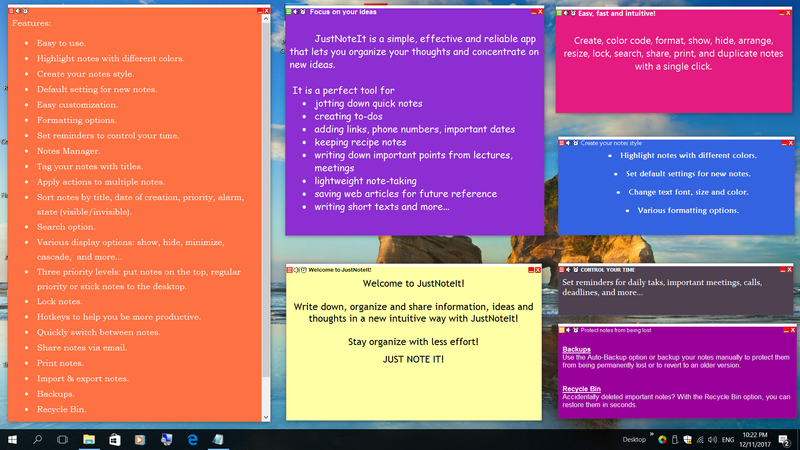 With JustNoteIt you can put important notes on the top of other windows, so that they are easy to access from any application. This is really useful if you gather information from different apps and windows to a note. 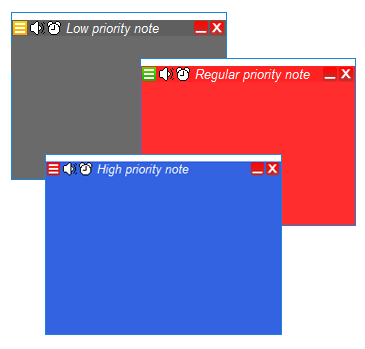 By default, JustNoteIt creates three notes with different priorities that show you how the priority levels work. High priority notes - keep the most important notes on the top of all windows. 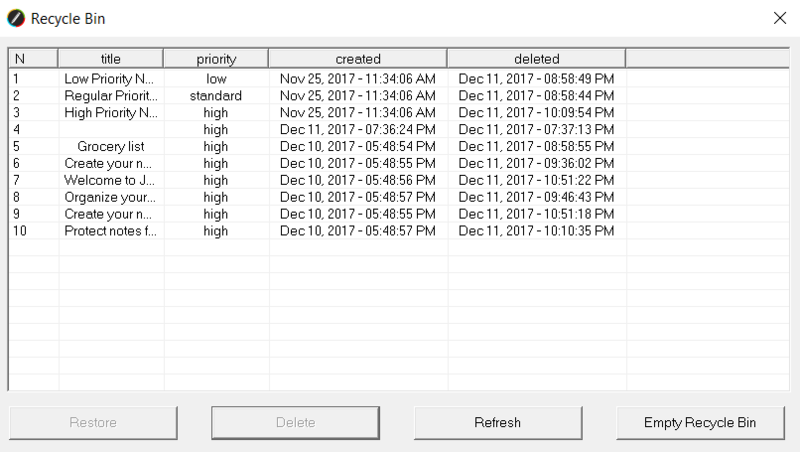 Regular priority notes - support standard windows order. Low priority notes - stick notes you do not often use to the desktop. Whether you are working on a project, report or presentation, planning a revision or gathering data on the web, with JustNoteIt you can focus on your ideas. ✓ View all notes at a glance in the Notes Manager. ✓ Sort desktop sticky notes by title, creation date, priority, alarm, and state (visible/invisible). ✓ Quickly switch between notes. ✓ Easily create, show, hide, delete, and print your sticky notes or set alarms. You can apply actions to multiple notes. 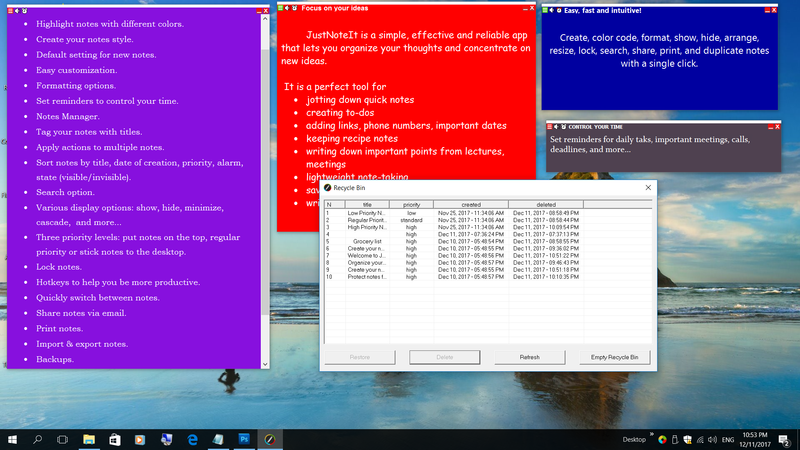 ✓ Arrange, sort and color code your desktop sticky notes to organize them in a way that works best for you. ✓ View and manage your notes in the Notes Manager. ✓ Tag notes with titles, date of creation and priority. ✓ Lock notes to prevent important information from being accidentally changed or deleted. ✓ Use shortcuts to quickly manage your sticky notes. Auto-Backup. We understand how important is to prevent accidental data loss. So, to protect your notes, each time you quit the app, shut down or restart your PC, the app automatically creates backups of your notes. Recycle Bin. Accidentally deleted important notes? It is a very common problem, which can drive you crazy and lead to a lot of problems especially if you deleted notes containing important information. With JustNoteIt, you will not come across this problem. 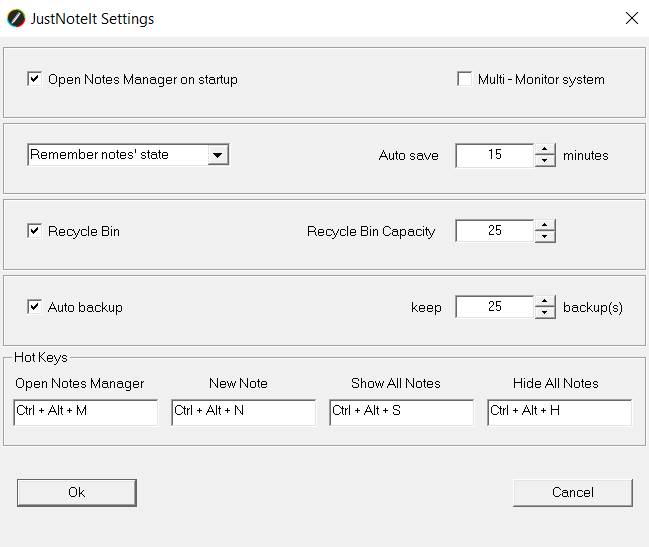 When you delete notes in JustNoteIt, they are moved to the app's Recycle Bin so you can easily restore your notes with one click. Set reminders for daily tasks, important meetings, calls, deadlines and more to track your time. It is easy, intuitive and fast. Create, color code, format, show, hide, resize, lock, search, share and print notes with a single click. Search in all notes, exclude minimized and locked notes from your search, limit search by the 'Match whole word' and 'Case sensitive' options. Hold your mouse over a sticky note's title to see a tooltip containing information about the date of creation, priority level and alarm. Send notes as emails for quick collaboration with colleagues and friends. Print desktop notes or save them as pdf. You may select to print one or several notes at once. Use the import and export option to transfer your desktop sticky notes to another computer or backup your notes. Use the Backup and Recycle bin options to protect important information. Make notes transparent, minimize and maximize notes, show, hide and cascade notes. 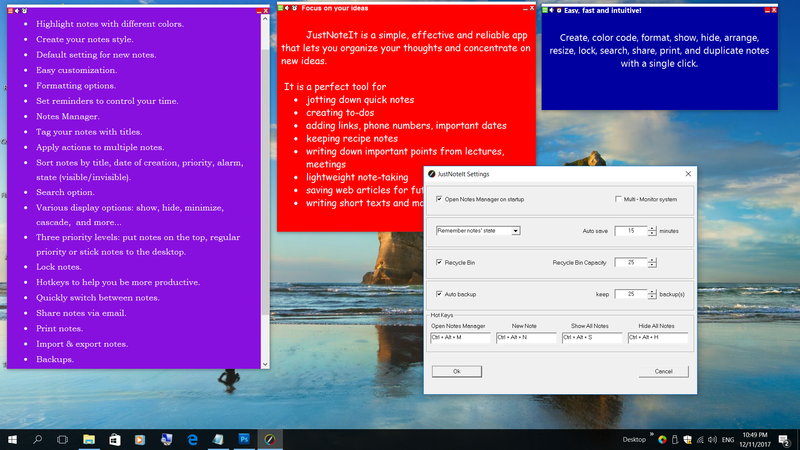 To download JustNoteIt for Windows 10, please click here.